DZMAGZ is an e-magazine,no paper edition,it's completely free and downloadable from the web.DZ E-Magazine is e-magazine about visual art and other art form for artists by artist that based in INDONESIA. 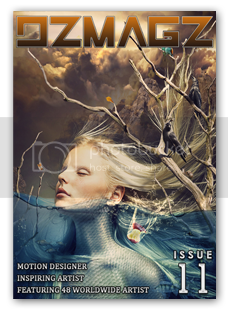 Published by 3 monthly, we collecting many artists, designer and motion artist then show them to public in best way. This is also a wonderfull way for artist to express themselves and give an opportunity for inspiration. It is dedicated to showcasing the best chosen artists across the world and most inspirational from around the world. DZ E-Magazine will act as food nutrition for your eyes. Our mission is promote all artists , designers and motion designers in order their works can be appreciated by people around the world and give opportunity to showing their ability and skill in art in various style. And we also bringing new talents out to the surface. At the same time we bring the artist and the user closer together. Our goal is give inspiration and encouragement to create wonderful works to designers especially in Indonesia and worldwide in general. We hope you enjoy the magazine and find the inspiration. Always keep supporting us to keep the project alive. Thank you for your support.